Not too ambitious, am I right? Laundry slides in and around all that other stuff, and it all gets done, and there's still time to make lentil soup. Also, pancakes for breakfast should have been on the list. Because there were pancakes. The ePortfolio portion of the day ("ePortfolio") should have been massively represented by very very very large text. Because it sort of dwarfed the rest of the day, to be honest. It was good to do, but damn. Those drafts ("drafts") aren't going to read themselves. 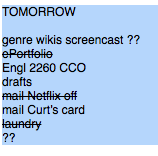 A small pinch of postponement can even things up a bit ("genre wikis screencast ?? "), and also a small--really, very small--bit of television (Justified) is necessary. If you take the sheets off the bed, to wash them ("laundry"), then you also have to put sheets back on the bed. Curt: could you just come over and get your birthday card ("mail Curt's card")? Would that make me a jerk? Okay, time to walk the dog. Which, in the interests of completeness, should have been on the list. Also: deciding what shoes to wear, remembering to get all the things we needed at the store, and finding the Netflix disks ("mail Netflix off") to mail. Once again, pancakes save the day. Pancakes are heroic like that. The megastore recommends just one thing. Open letter to my ride home.